"In the center of it all" is a quote that best describes the St. Germain, Sayner, Star Wisconsin region of central Vilas and north central Oneida counties. The diversity of water that is found nestled between the Minocqua area to the west and the Eagle River area to the east offers anglers many unique challenges for beginners and experts alike. Those who venture to this region of northern Wisconsin have ample opportunities to explore the smaller glacial pothole lakes as well as the busier recreational destinations that offer many top resorts and excellent public and private campground facilities. In addition, the Wisconsin River and accompanying Rainbow Flowage provides an exceptional setting for not only fishermen, but wildlife enthusiasts as well. While many anglers came to this section of the North Country in search of walleye and panfish, excellent opportunities also exist for muskie, bass, and northern pike. 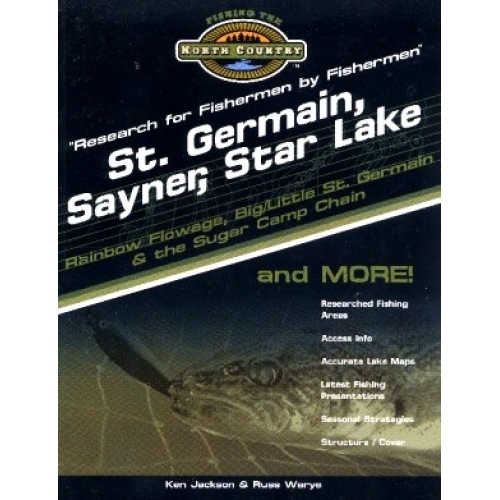 Many of the larger lakes in this region such as Star, Plum, Big and Little St. Germain, Pickerel, and the entire Sugar Camp Chain offer challenges at several species and can satisfy a wide range of anglers. The ability to please such a large group of lake users makes this region a popular choice and a terrific fishing experience. 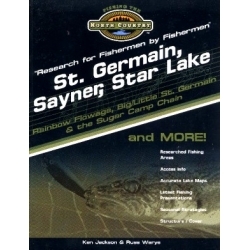 Some of the lakes included in this book are: Alma, Aurora, Ballard, Big St. Germain, Bittersweet, Boot, Bragonier, Buffalo, Camp 10, Chain, Lake Content, Dam, Dog, Echo, Fawn, Finley, Found, Frank, Irving, Laura, Little Bass, Little St. Germain, Lone Tree, Lost, McDonald, Moon, Muskellunge, North Nokomis (Swamp), Oberlin, Partridge, Pickerel (Oneida County), Pickerel (Vilas County), Plum, Prong, Rainbow Flowage, Ross, Salsich (Bass) Lake, Sand, Shannon (Anderson) Lake, Smith, Snipe, Star, Starret, Stella, Stone, Wharton, White Birch and Witches lakes.